I had a 20-something epiphany of sorts this week. I'm not positive that epiphany is the right word. Perhaps realization would be best? Regardless, something that I had always been taught made sense. I started to actually live this piece of advice, and I can tell you that it feels like 1,000 bricks were lifted off my shoulders. I feel in control and incredibly powerful, even though I'm just one person in a 5'5'' frame. One thing about me? I'm a tiny bit stubborn and I have a lot of pride. These things can be awesome, but they can also cause a ruckus inside my head. I feel a tad like a walking oxy-moron. I can't stand rthe same ol' same ol' and thrive on change and spontanaeity, however, I get angry when I see people not sticking to the rules. For example: part of my job is to order supplies. There is one employee who never fills out a supply order form, but they should because it would help me (and accounting) out tremendously. I get so infuriated with this! Like, just fill out the form. You aren't above anyone. Everyone else has to do it, so you should too. It's the principle of things. Another prime example? When I first moved out here, I was moving and shaking, making things happen (hope I still am). I was doing the 'acting thing' (but not really) and one of my friends told me that her friend was like, "So, what, is Kirbie now all of a sudden an actress?" That friend in particular was (is?) an actress and felt like I was tredding on her terroritory. Then I was told I would never be a Meryl Streep, but more of a Julia Roberts. This is comical because A) as a child, I did want to be an actress. I took classes, partook in plays and musicals. I wanted to be Julia Roberts. Then my aspirations changed, but I stil had a soft spot for acting in my heart. B) How am I interfering in this other person's goals and dreams by doing something I want to do? Me being successful at something doesn't mean that she couldn't be either. So this whole thing had me in a huge tizzy until I realized I was doing this exact same thing a few weeks ago! Don't you just love that? God has a huge sense of humor. I was getting upset that other people were treading on my career "territory," when it's not just mine to begin with. I kept thinking, "Why are they succeeding when I've worked so much harder? I want this more than they do! And they just waltzed in and got the job." Yes... sounds childish and ridiculous now that I type it out. There's a point, so bear with me. Then there's that other part of my pride when it comes to loyalty. If I feel someone is betraying me, making me look like a fool, and so on, I get into immediate defense mode. I should be a contractor with the walls I (can) build. I (would) start thinking up things in my head about how when I'm successful, they'd really be sorry!!! So dramatic, right? But a couple of nights ago, I was on the tredmill and was fantasizing this one scenario in my head (don't judge me). I had just been offered a huge deal: my website had been bought, I was going to have creative input on an upcoming tv show, and I had gotten a book deal. I'm standing there signing the contract with my mom and my dad. As I'm envisioning this, I realize the last thing I'd doing is thinking of all the people that have hurt me. I'm not ecstatic and saying, "Look at me now, haters!" I'm just standing there thrilled and so proud of myself. That's when I had the "epiphany." Joyce Meyer reinforced this mantra during a sermon I listened to this week. She said that having anger towards others and taking pity on yourself doesn't help. It's not like you having these emotions changes someone else, and it's more detrimental to you than anything. It's the devil working, making you feel like you can't be happy because you've been hurt. You can control your thoughts and emotions! You don't have to think certain things that can keep you down. We can't stop what pops into our minds sometimes, but we can stop how far that thought goes. We can redirect and regroup. 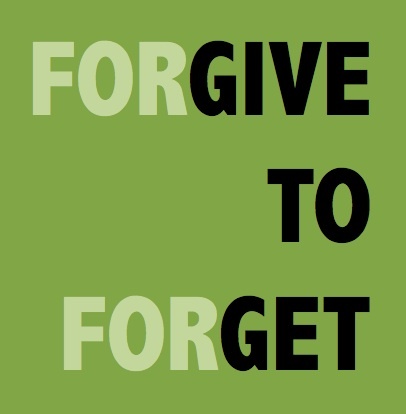 So when you hear "forgive and forget," it really is the best way to go. I used to hear that and be like, "But HOW! How can you forgive when someone has done you wrong? Or has hurt you? How can you forgive the things they said?" Or worse? "How can I forgive myself for what I have done?" I think watching that Amish Pride movie on Lifetime has something to do with this. Don't laugh... I'm serious! The Amish community pushed aside their emotions -- some lost their children -- and went over to the shooter's house to offer sympathy to his wife. I mean, I think about this all the time and I don't know how I would be able to do something like that. I'll attribute it all to grace. Forgive you enemies, forgive those you love, and forgive yourself! Then set it free.